Apple spent $5 billion on a beautiful new office, Apple Park. So it’s amazing they’re about to make an extremely costly, avoidable mistake: putting their coders in an open-plan layout. I work at Fog Creek Software, where our cofounder and former CEO Joel Spolsky has been blogging for at least 17 years about how open-plan offices are terribly bad for programmer productivity. His insights on the topic are based on Tom DeMarco and Tim Lister’s classic book Peopleware, which has been around for literally thirty years. So this isn’t a particularly new insight. And of course, in the decades since, there have been countless academic studies confirming the same result: Workers in open plan offices are frustrated, distracted and generally unhappy. That’s not to say there’s no place for open plan in an office — there can be great opportunities to collaborate and connect. For teams like marketing or communications or sales, sharing a space might make a lot of sense. But for tasks that require being in a state of flow? The science is settled. The answer is clear. The door is closed on the subject. Or, well, it would be. If workers had a door to close. Now, when it comes to jobs or roles that need to be in a state of flow, programming may be the single best example of a task that benefits from not being interrupted. And Apple has some of the best coders in the world, so it’s just common sense that they should be given a great environment. Usually, companies justify putting programmers into an open office plan for budget reasons. It does cost more to make enough room for every coder to have an office with a door that closes. But given that Apple’s already invested $5 billion into this new campus, complete with iPhone-influenced custom-built toilets for the space, it’s hard to believe this decision was about penny-pinching. The other possible argument for skipping private offices would be if a company didn’t know that’s what its workers would prefer. But we can test this theory— let’s see what it looks like when we ask people what they want in an office, without any prompts or suggestions to guide their responses. What’s the best feature you’ve had at an office, either past or present? What you’ll find in the hundreds of responses to that tweet is dozens and dozens of people talking about how much they loved having a private office with a door that closed, or how much they wish they had one. There’s no doubt that Apple would get the same responses if they talked to their own team. 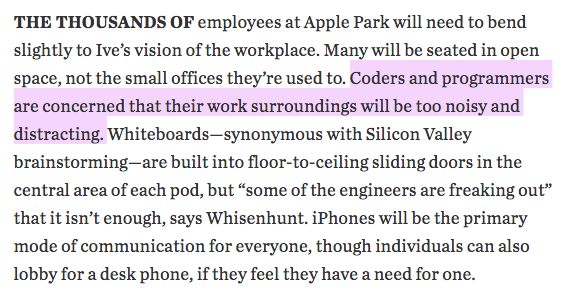 So the only possibility that’s left is that there just aren’t enough people in the industry who really, truly believe the benefits of having private offices for coders. So we’ll keep banging the drum on this subject. Almost a decade ago, I remember reading about the construction of the new Fog Creek office on Joel’s blog, and when it was finally complete, I remember seeing the New York Times breathlessly cover its innovations. At the time, I would never have imagined that I’d get to work from that office someday. And I’ve been thinking a lot about how it felt to look at that article and wonder a bit skeptically whether it was really worth all that effort. And I have to admit, I had a moment of temptation as we started thinking about a new office for Fog Creek, wondering whether we might save a few bucks by having an office that was merely great, with the same open plan as almost every other company. It’d be so easy to make the case. A lot has changed at Fog Creek — about 2/3 of our company works remotely, though almost all of them work from home offices that have, you guessed it, doors that close. And we’ve got teams like sales and support that benefit from being in a shared, open-plan space. We could make the argument for giving up and just falling in line with what everybody else does. But even the teams that have shared spaces are excited about our new office having dedicated phone booths for them to make calls in a private space. And the members of our technical staff remain as hyper-productive as ever without working absurd hours, which we can attribute to them having the right environment to do their work. Best of all, focusing on making a great workspace even has us thinking of new ideas that help people get the best of both worlds, like dedicating a large conference room as a “Quiet Car”. It’ll be a place where people can sit together but still enjoy peace and quiet, inspired by everybody’s favorite Amtrak amenity. We would never presume to advise a company as successful as Apple about how to do products. Though we’re incredibly proud of Glitch and Manuscript, we of course have huge respect for everything Apple’s done for decades. But we didn’t want to let this one avoidable mistake go by without pointing it out, as it’s a shortcoming that Apple (and every company that has coders on its staff!) could easily fix. We’re glad so many companies know it’s worthwhile to invest in their employees — in everything from great healthcare to having the latest-and-greatest computer hardware. But when it comes to forcing every worker to be in an open plan shared space, even when they’re trying to concentrate, it may be time for even the biggest and most successful companies to think… uh, differently?